JULY 2007 ISSUE | The Quibbler Newsmagazine: For Perfectly Accurate News! Below are links to all the articles you will find in this issue of The Quibbler. - July = Harry Potter Month! - What's YOUR favorite HP book? - What could the Deathly Hallows be? - Will It End With You? - What do you hope the last two movies will do? 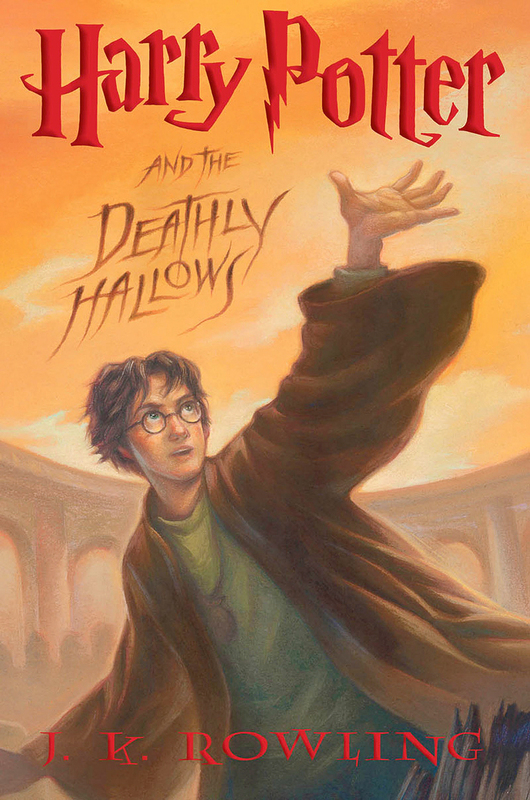 What's the best HPDH book cover? One of the reasons there have been so many different theories on what the "Deathly Hallows" of Harry Potter and the Deathly Hallows are is because there are four different covers for us to work with. With four covers that are so completely different from one another, it's difficult to pick a favorite. Many are partial to the U.K. Adult's cover because of it's classy and simple look. 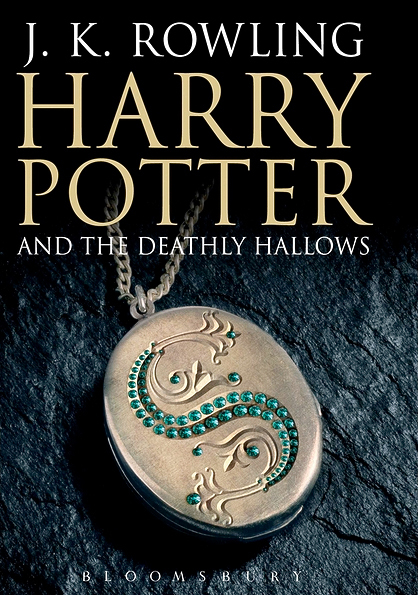 With the Slytherin pendant being the only thing on the cover, readers wonder just how important it is in the grand scheme of things. Perhaps it's the pin that holds everything together? Or maybe its purpose is something even more important. We'll see! Some readers like the U.K. Child's cover since it's so colorful and exciting. The front cover is very action-packed and filled with several details, all of which can be viewed from simple to symbolic. Viewers are also left to wonder where the magical trio are and whether they are being sucked in or thrown out with all that gold. The side-flaps of this cover also sport important details. One of them shows a picture of Harry's patronus, a stag (which is also his father's animagus form), and the other flap shows a snake (presumably Nagini) inside what might be one of the spheres in which prophecies are kept. Lastly, the back cover features a nighttime Hogwarts scene with an ominous cloud of billowing smoke in the near vicinity. Very curious! The U.S. edition covers are unique, in that they are wrap-around covers. This means when you take them off your book and flatten them out, you'll see one wide picture/scene. Many fans favor these covers for the artwork alone, as Mary GrandPre's artwork is stunning and unique. 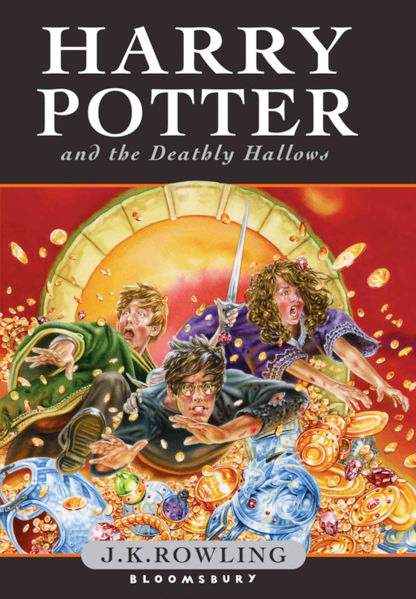 But art skills aside, the first U.S. cover features Harry and Voldemort, dueling in what seems to be a graveyard. Maybe that location is called "Deathly Hallows"? The most curious thing about this entire scene is Harry and Voldemort seem to be dueling without their wands. We know they are capable of wandless dueling, but the fact that Harry and Voldemort share wand cores has been very important in the series, so where are their wands? Tucked away by choice or due to other circumstances? The orange color also raises many questions. Does it represent dawk or dusk? Most likely dusk, symbolizing that Harry's story is coming to an end. The Deluxe Edition is very similar to the U.S. cover, in that they feature the same colors, but also because GrandPre is the artist as well. 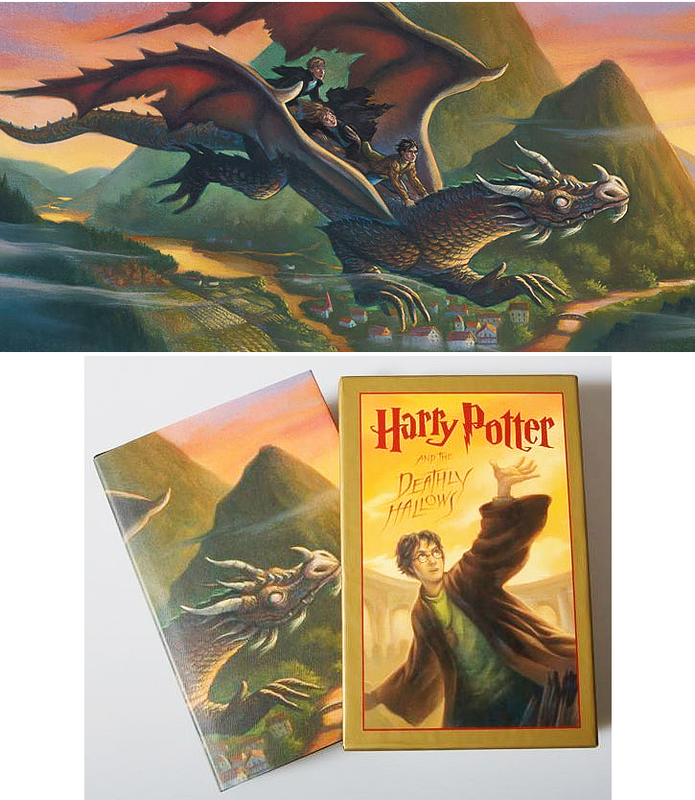 This cover features Harry, Ron, and Hermione on a dragon's back, flying across a more or less empty orange sky. What worries a few people is Hermione seems to be lying down. Maybe she's injured! Ron looks pretty anxious behind her. Cleary, each cover offers a different kind of artwork and many different things to think about. Personally, although I love that the U.K. Child's cover includes several details, I think the U.S. cover is my favorite simply because I adore Mary GrandPre's artwork and also because I think a scene featuring both Harry and Voldemort on the cover is very fitting since their battle is what has fueled this entire series and Harry's story. "Harry Potter", "The Quibbler", and all other names associated with the Harry Potter series of books and the Harry Potter movies are trademarks of Joanne K. Rowling and the Time Warner Entertainment Company, L.P. All images and materials related to the Harry Potter novels and/or movies are copyright Joanne K. Rowling, Scholastic, Inc, Carlsen Verlag, and Bloomsbury Publishing. "The Quibbler" and www.the-quibbler.org is a fictitious webpaper and a non-profit website that is not in any way affiliated with J.K. Rowling, Bloomsbury Publishing, the AOL Time Warner Entertainment Group, Scholastic Books, or Carlsen Verlag. 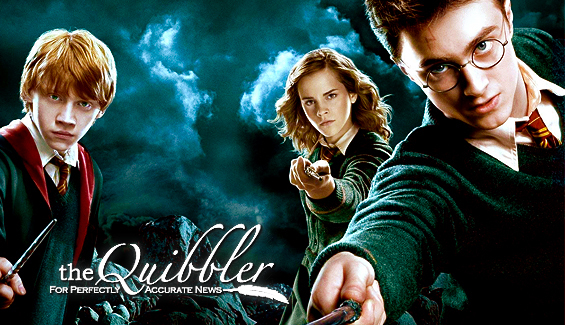 The Quibbler Logo is copyrighted to The Quibbler Newsmagazine and is courtesy Jennifer Smith. All original writings and pictures appearing on this site are copyrighted to their respective artists.